Unveiled this week at Tokyo's MotorSport Japan Show...STUNNING! Sorry for the lack of updates, Iv been so busy with things lately that I have not had time to update my blog! But I got some free time tonight to sit down and write. The next few weeks will be very busy, but from November things should be pretty fun. Hopefully I can enjoy some good times then and bring you some good and interesting updates. Maybe even a few surprises along the way, so stay tuned! 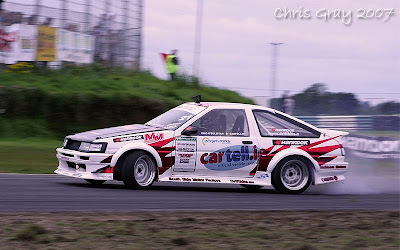 The final round of Pro Drift Series, Ireland took place in Tipperary at the weekend. Unfortunatly I didn't make it to the event, I had been sufferent from a bad flu at the time. Eric O'Sullivan won on the day...Also the 2007 Series Champion! Unfortunatly there is bad news as the season ended. The Rosegreen Speedway is now in danger of being closed down. So let's just hope and pray that things go well and we can see drift action at Rosegreen again next season! On another note, some latest news from D1GP. Kawabata San won the latest round at AutoPolis circuit. He defeated Ueno Takahiro from T&E in the final...well done to you both! I hope to catch up with Mr.Ueno again in January! 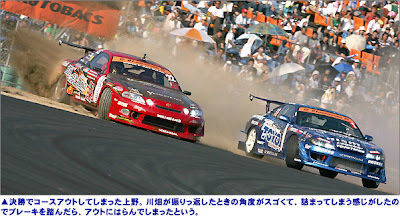 Photo from D1GP Website..